Here’s what I’m listening to over the next hour. Using the Amarok player, I’ve set up a dynamic list that finds songs with (Rating > 3 stars and ( (PlayCount = 0) OR (LastPlayDate MORE THAN 90 days) ).This gives me a nice, fresh mix of the 11,800+ tracks in my library. 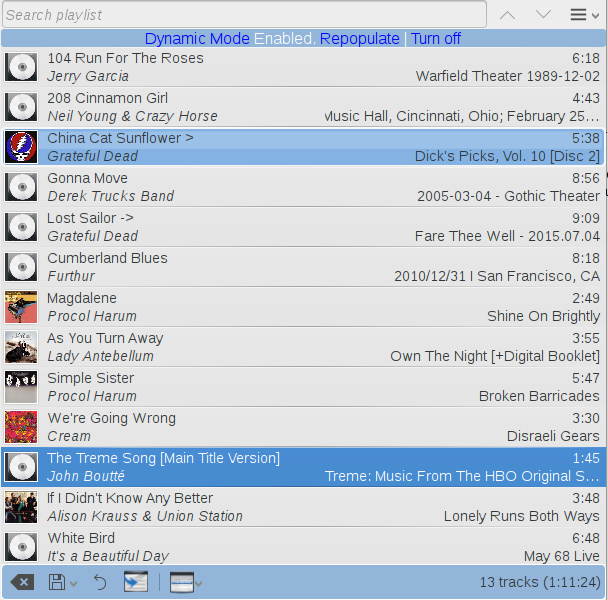 I had been an Amarok user since my early Linux days, but then they messed up the playlist functions and I switched to RhythmBox. Recently, RhytmBox became totally unreliable on my Fedora 23 system, so I switched back to Amarok. It’s a happy experience.